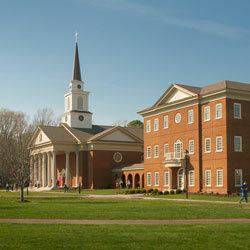 Dr. Lyle Story has been teaching in Regent University’s School of Divinity for nearly 35 years. He uses innovative methods to educate online learners. He’s committed to engaging students on an academic, personal and spiritual level and carries a wealth of knowledge and experience. Q: Explain your experience with teaching online courses, and how do you enhance an online learner’s experience? A: Well, first of all, I’ve done a truckload of online learning ever since it started here at the university. The last couple years, I’ve been moving a lot more into blended classes. A blended class is where we have physical students in a classroom and online students from different parts of the world. We’re all in Blackboard Ultra at the same time. So, for example, I just finished a Greek class, and after explaining concepts and taking questions, I put Greek sentences up on the screen. Both online folks and on-campus folks can type their translations on the screen. With a couple of classrooms that are specially fitted, there’s a special camera in the room. There are suspended microphones and speakers in the room so we can clearly hear the online folks. They can hear us and they can see us as we’re making our way through class. Q: How do you maintain relationships with online learners? A: I maintain regular contact with all the students, whether they’re online or distance, through phone calls, Skype, and email. In my New Testament course, we have an additional feature called voice threading where they’re able to record themselves in either an introduction to themselves with video, or they can respond to a discussion question using audio and video. And then I, or other students, can add a comment to what they’ve added. And that will include the video as well as [an] audio response. I have Collaborate … sessions all the time … things like personal phone calls, where I’m moving beyond just talking about course material [and] probing some areas of life, [engaging] them [about] where they are, [their] family, job, struggles they’re going through, dreams, aspirations. I mean all of those things are important to me, not just their academic performance in my class. Q: Can you recall an instance that highlights your experience? A: So, in the last half of my New Testament course, students are responsible for what I call a fishbowl project. They engage on a topic as a small group, presenting different views, different opinions, different research, and the people that are part of the larger class, they can overhear that, and then after the presentation, raise questions and make comments. A lot of good stuff happens in those small groups. In my New Testament class, within these small groups, they are responsible to respond to discussion questions relating to spiritual formation with the material that they’ve been working with. Even though online folks may not meet until graduation, they form some lifelong bonds that carry through even after graduation. Q: What would you say to someone who is thinking about pursuing a degree via online education? A: It’s a great opportunity for people to be fully engaged in their work, jobs they have, schools for their kids, their church situation, their financial status, without taking a major hit that is involved with relocation to Virginia Beach — finding a new job, finding a church, discovering how [they] can make ends meet … schools for their children, housing — all that it takes for a family to be uprooted from one place to another. It’s a lot when people have their whole families to consider.